Having trouble viewing on your mobile device? Switch to landscape mode, or visit page on a desktop computer to "Select Your Own Seats." To book a group, please call the box office at 519-672-8800. 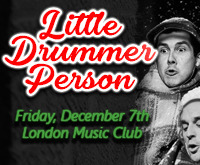 Held tickets may be picked up at London Music Club on the day of the performance, or in advance from the Grand Theatre. Sign up with your e-mail for the latest on productions, events, promotions, and more!